Tisbury selectmen uphold suspension; board also approves license renewals. 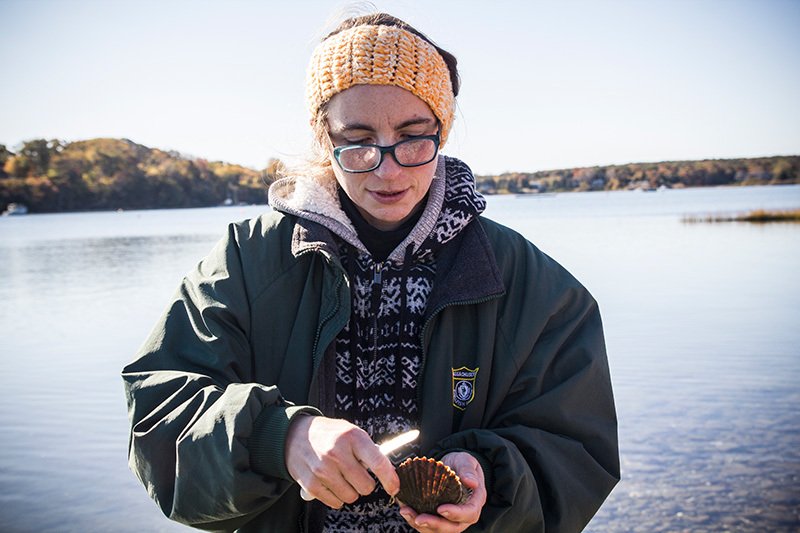 Tisbury shellfish constable Danielle Ewart, shown here in a file photo, suspended the licenses of two fishermen who were allegedly harvesting scallops on a "freeze day." Two commercial shellfishermen had their licenses suspensions upheld, and are being delayed in getting their 2018 licenses, after they allegedly violated the town’s shellfish regulations by fishing for scallops on a so-called freeze day. At Tuesday’s meeting of the Tisbury board of selectmen, Glenn and Mitchell Pachico had their licenses suspended through Jan. 17, despite the vigorous objections of their attorney, Ryan Searle, who said the two men weren’t provided due process. Tisbury shellfish constable Danielle Ewart imposed the sanctions immediately after citing the two men on Dec. 17 for fishing in 26° weather. Fishing is supposed to be suspended when the temperature drops below 29° Fahrenheit, Ms. Ewart told the board. The Pachicos were also cited for not turning over their catch as she ordered them to do. But Ms. Searle said Ms. Ewart watched the two men fish for three hours and, without warning, approached them when they arrived at the dock. She acknowledged that they didn’t turn over the catch, but instead dumped the scallops back into the water, upset that Ms. Ewart had allowed them to gather three bushels and return to the dock before confronting them. Mr. Israel said the response should have been appropriate. “I would be upset, but I would hope that my response would be measured in showing how upset I was,” he said. The men have evidence that the temperature was above what’s required, Ms. Searle said. She called the citation “bogus,” and asserted that Ms. Ewart is out to get the two shellfishermen. “Shellfishing is not a right, it’s a privilege. You have to buy a license for it,” Ms. Ewart said. Though Ms. Searle asserted repeatedly that the selectmen were overstepping their bounds, town administrator Jay Grande told the board he consulted with town counsel, who recommended selectmen uphold the suspension and not renew the 2018 permits until the 30-day suspension was over. James Tilton, chairman of the Tisbury Shellfish Committee, spoke in support of Ms. Ewart, and implored selectmen to send a message to the Pachicos. He said Ms. Ewart has been harassed and bullied for enforcing the town’s regulations. He said had he been confronted earlier in the day, he would have turned over his catch. “There’s a little more to the story that you need to know about,” he said. The board unanimously upheld Ms. Ewart’s decision to suspend the license and Mr. Grande’s decision not to renew the 2018 license until the suspension runs its course. Selectman Tristan Israel did so reluctantly, even pausing before casting his vote, saying it was difficult because he knows everyone involved, and understands that shellfishing is a livelihood. “I hate going through this, and I don’t know why we keep going through this,” Mr. Israel said. In other business, the town renewed the annual all-alcohol and beer and wine licenses for Mikado, Garde East, Black Dog Tavern, Rocco’s Pizzeria, Black Dog Bakery and Cafe, and Little House, but not before Mr. Israel raised his objections, once again, to the way Black Dog Bakery and Cafe serves beer and wine. Mr. Israel said the intent of the law was to have a waiter or waitress take a drink order at a table and then serve the drink at the table. Black Dog Bakery and Cafe takes drink orders at a counter and then a waiter or waitress serves it. Mr. Grande and selectmen chairman Larry Gomez said the popular eatery is following the town’s bylaw. If someone wants an additional beer, he or she has to go back to the counter, Mr. Gomez said. “Let’s just have bars and get it over with,” Mr. Israel said. The town began allowing restaurants to serve all alcohols after a vote last spring. There have been no incidents reported since the new town bylaw went into effect. The board also unanimously approved renewal of 14 common victualler’s licenses, as well as three licenses for inns. It reappointed Ben Robinson, chairman of the town’s planning board, to the Martha’s Vineyard Commission. Board members asked him to make regular updates on commission business. The board’s administrative assistant, Alexandra Kral, was appointed the town’s representative to the Vineyard Transit Authority board. Mr. Grande will use Robert Haas of Strategic Policy Partnership, a consultant the town has used to study police practices, to help pick the next police chief. Selectmen recently decided not to renew the contract of Chief Daniel Hanavan, though he was given a short-term contract to stay on board while the department seeks his replacement. The board got its first look at upcoming town meeting articles, including $1.7 million to replace a seawall on Beach Road. The town is seeking a grant for the nearly $6 million project, but would still have to kick in the $1.7 million, Mr. Grande said. Mr. Israel said the town should look to the state, commission, and other Island towns to help pay for seawall repairs, since it protects a vital route to Martha’s Vineyard Hospital. Selectmen approved a conservation restriction on Lot 41 in Vineyard Haven.